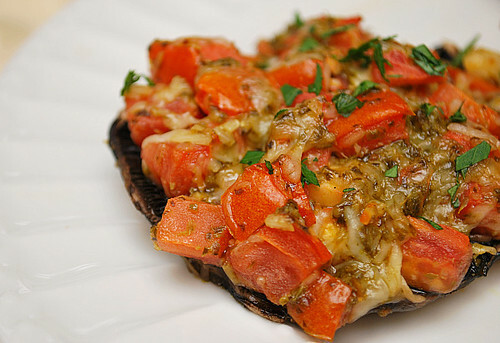 Portobello mushrooms are wonderful to stuff because they are a nice size and the shape allows for lots of stuffing. This recipe involves chopped tomatoes, a bit of homemade pesto, shredded parmesan cheese and a splash of balsamic vinegar. 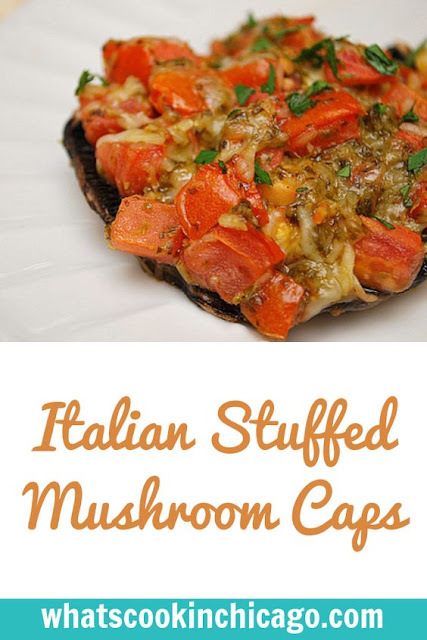 Everything is tossed together, stuffed into the mushroom cap and then baked until the cheese melts. It's a perfect side dish for any Italian inspired menu! Combine the remaining ingredients in a bowl. Stuff the mushroom caps with the tomato mixture and place on a baking sheet. Bake in the preheated oven for 15 minutes and serve hot. yumm sounds like a great filling!! I would love those! i loooove this recipe. The feeling of sinking your teeth in these lovelies is nirvana. My wife cooked this last week and everyone only had one piece each. About daddies getting the best part or getting more than everyone else? All a lie. I love stuffed portabellas, amd this version sounds amazing! My freezer is overflowing with pesto right now because I keep making and freezing more....I will keep something like this in mind!